Every family’s circumstances are different, and financial constraints usually determine the options. The solutions almost always require some creative thinking. Perhaps one or more of the children is angling for a room of his or her own. Maybe you can no longer pretend that the dining table makes a suitable home office. Or there is just nowhere left to put all that stuff you have amassed. So begins a conversation that may wax on for years: Do you fix the limited space you have, carving square feet out of thin air? Or do you pack up and move to a larger home, a decision that could mean giving up a treasured neighborhood, a beloved school or an enviable commute? Either decision could be pricey. Closing costs on a new condominium or house can easily reach five figures, and a larger home usually comes with a bigger mortgage and higher maintenance costs. Expand your existing property, and you can expect to spend, on average, somewhere between $42,287 and $110,000 for a high-end project, according to national figures calculated by HomeAdvisor. Moving to a larger home in a new neighborhood may mean taking a chance on an area you do not know. “To do a trade-up without a windfall of money, you need to take a leap of faith,” says Danielle Lurie, a sales agent with Compass. Commit to the home you have, and other trade-offs await. You may invest in a lengthy — and expensive — renovation, or have to learn to get more creative with the space you already have. And you may expend all that effort only to find that the space still doesn’t work. Just think of all the fretting families on the HGTV franchise “Love It or List It,” who rip apart their existing quarters while simultaneously looking for something better. Every family’s circumstances are different, and financial constraints usually determine the options. The solutions almost always require some creative thinking. Here are the stories of four families — two in the city and two in the suburbs — and their journeys from cramped to comfortable. 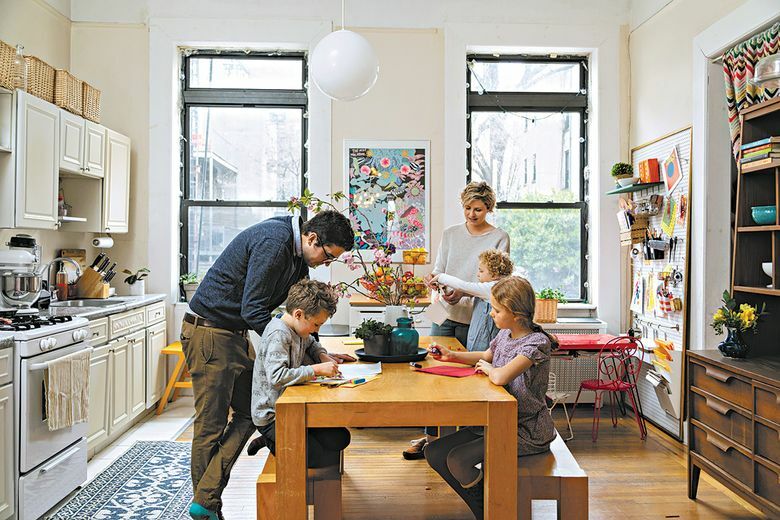 Nine years ago, when Linsey Laidlaw and Brian Morris moved into the parlor-floor apartment of a brownstone on Henry Street in Carroll Gardens, Brooklyn, the tiny second bedroom made for a great nursery for their 1-year-old daughter, Ivy. With high ceilings and an open floor plan, the apartment felt spacious. But then they had two more children, and that little nursery got very crowded. The three children, Ivy, now 10, Oliver, 7, and 4-year-old Rosie, share that tiny bedroom, which has a curtain in lieu of a door. About five years ago, Morris, 37, a lawyer who used to work in construction, customized a loft bed for the two older ones, adding shelving and storage. At one point, a crib also fit beneath the loft. Until earlier this month, when Morris finally built a bed for her where the crib once stood, Rosie slept on a mattress next to the bunks, in an area she called her nook. Conversations about moving happen often, but always lead back to their tiny quarters. Their landlords have hinted that they would like the family to vacate the apartment so it could be renovated, but have been flexible. They have considered the suburbs, but Morris would no longer be able to bike to work in the financial district, and the children would have to change schools. And at $3,200 a month, the rent is manageable, and the neighborhood is home. The family has traveled to Los Angeles; Austin, Texas; Oakland, California; and even London to scout out alternatives. But as soon as they return, they forget the fantasy life they briefly entertained. “We can’t figure out a place that feels quite as right,” Laidlaw says. And so they make do, combining Laidlaw’s eye for design with Morris’ carpentry skills to conjure space where little exists. 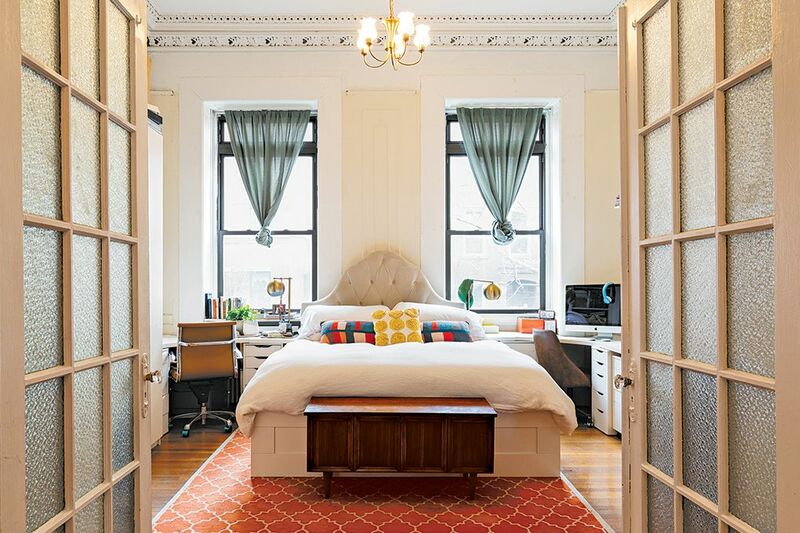 Built-in bedside desks in the master bedroom gave both parents a place to work. Laidlaw hung a pegboard on a wall, filling it with storage bins of art supplies for the children’s projects. About 18 months ago, Deanna and Stephen Dorey began to wonder how much longer their sons would be willing to share a room in the family’s three-bedroom house in East Hanover, New Jersey. Their daughter, Alissa, now 16, had her own bedroom, with a daybed and pink walls. But their sons, Stephen Jr., now 14, and Vincent, now 8, shared a small bedroom. They assumed that by the time Stephen Jr. started high school in 2018 he would want his own space. “I knew he was going to start torturing us,” says Deanna Dorey, 45, who owns a cheerleading and karate school. Stephen Dorey, 51, works in business development. Deanna Dorey started visiting open houses but couldn’t find anything that compared to the bi-level ranch she and Stephen Dorey bought 15 years ago and gut renovated, installing a new kitchen and bathrooms, adding a deck and reconfiguring the lower level into a great room, which the Doreys envisioned would be used as a second family room, as the house had a formal living room and family room on the main floor. The couple considered adding a fourth bedroom in place of the deck, but estimated that the project would have cost $60,000 to $80,000. Then, in December, the boys were cast in “Get Out of My Room,” the Universal Kids show. The producers took a hard look at the great room. With sliding glass doors leading to a sun porch, the space had ample light. But it was rarely used because it felt cut off from the main level where the family congregated. The Doreys had briefly considered converting it into a bedroom for Stephen Jr. but dismissed the idea because he would be sleeping so far from the rest of the family. The producers suggested turning it into a new master bedroom instead. A parental retreat sounded like a better idea. And so began a great reshuffling. The Doreys would take over the great room, Alissa would move into her parents’ old room. Stephen Jr. would move into Alissa’s room, and Vincent would get the shared room to himself. In January, before the crew returned to shoot the show, the Doreys spent $4,000 dividing the great room with a wall, making one half a new master bedroom and the other a private sitting room. Alissa replaced the light fixture in the old master bedroom with a chandelier and added beanbags. Then the crew returned, and in a week, transformed the boys’ rooms. The producers sat down with Stephen Jr. and Vincent to help them make their wish lists. Stephen Jr. wanted a space where he could entertain friends. Vincent wanted a waterslide, which, unsurprisingly, was not possible. But other ideas, like a loft bed, could happen. So faux-brick wallpaper and a graffiti wall replaced Alissa’s pink-and-yellow walls. Vincent helped build a shelf for his brother’s numerous shoes. Vincent’s room took on a baseball theme, with a loft bed and a display area for his trophies. And instead of a waterslide, he got a ladder made from baseball bats, and a lounge area designed to look like a dugout. The process reconfigured not just the bedrooms, but the way the family used the entire house. The children used to do their homework at the kitchen table, but now they spend more time in their rooms. Stephen Jr.’s, which has a television and a mini fridge — items on his wish list — has become their hangout. And the great room, which never got much use before, is now the grown-up retreat. “It almost feels like we put the addition on, but we didn’t,” Deanna Dorey says. Here’s a bit of wisdom: If you are heavily pregnant with your second child, do not trade a spacious loft in the Pencil Factory in Greenpoint, Brooklyn, for a tiny one-bedroom condo. That is what Kara Welker and Tim Fornara did. Eager to own a place but reluctant to move away from friends and their nanny share, the couple bought a tiny duplex apartment in the building next door in 2014. It didn’t take long for them to realize the error of their ways. “What drove me insane was trying to keep a little baby quiet in a very small space,” says Welker, 45, a partner in a talent management and production company. They tried to carve out space, opening up the area beneath a stairwell for a play area for the children, Sorcha, now 5, and Franklin, now 3-1/2. “They bonked their heads on the stairs every day,” says Fornara, 41, the founder of Pretty Fast, a television production company. The couple hired an architect who, for $6,000, drew up plans to build a small nursery at the top of the stairs at the entrance to their private roof deck. But building the addition would have cost $40,000, and would not have fixed the unfixable: They were a growing family with a baby who struggled to sleep, living in an apartment that already felt too small. The time had come to leave the nest, even if it meant breaking away from a neighborhood they adored and close friends nearby. Fornara considered moving to the suburbs, but Welker was not interested. “I moved to New York City to be part of New York City,” says Welker, who grew up in Los Angeles. They zeroed in on Bedford-Stuyvesant, Brooklyn, finding a two-family brownstone in need of work. “It was one of those deals where it had been who knows how many apartments,” Welker says. The couple bought it in February 2016 for $1.05 million, and sold their condo for $1.15 million. They moved out of their condo into a construction site. The house needed a roof, boiler, electrical system, a water heater, a new kitchen and new bathrooms. The entire top floor also needed to be restored, a project that involved removing an oddly configured extra kitchen to make room for Franklin’s bedroom. Contractor estimates put the job at about $500,000. Welker and Fornara balked. They turned to the handyman who had worked on their condo and was starting a contracting business. He offered to do the job in stages, at a much lower price. To save money, the couple looked for deals, taking out a loan for a new roof through Home Depot and sourcing their own materials. They turned to personal connections. A friend who is an architect drew up plans at a deep discount. When another friend decided to renovate her kitchen, Welker asked for her old cabinets and appliances, including a wine fridge. The marble countertop broke in transit, but the rest arrived intact. Welker spent days at salvage yards in Queens and New Jersey and scoured the internet for deals. “I would internet-drill for oil until I found the perfect light fixture,” she says. When landscapers estimated that renovating the backyard would cost $20,000, the couple did it themselves for $3,000. They ultimately cut the renovation budget in half, restoring the home for $250,000. For 12 years, Faith and John Dowgin lived in a 1,100-square-foot Cape Cod-style house in Spotswood, New Jersey, with their son, Caden, now 13, and Faith Dowgin’s mother, Caroline Agnew, who occupied the basement apartment. But 2-1/2 years ago, along came another baby, Emmet, and their cozy quarters became crowded. “We were going to have to figure out something,” says Faith Dowgin, 47, who works in nonprofit management. John Dowgin, 42, a playwright, does software development. For $2,000, an architect drew up plans to add a third bedroom on the second floor. One contractor estimated that the project would cost $60,000, nearly triple what the architect had projected. Another one never returned with a quote. In April 2016, Faith Dowgin’s mother died, and plans were shelved. But last summer, John Dowgin received stock options from work, a windfall that gave them new options. In January, they began to look at houses. The second one they saw was a 2,100-square-foot ranch less than a mile away. Faith Dowgin had been skeptical when she saw the listing. The home needed a new roof, as well as electrical repairs, and the original 1960s kitchen sorely needed an update. But when she walked through the door, she was swayed by the sprawling space: four bedrooms, a two-car garage, a family room and an eat-in kitchen. A fully finished basement added another 2,100 square feet of living space. “The minute we walked in, it felt like our house,” Faith Dowgin says.